Supreme Industries, Inc. (NYSE MKT: STS), is a nationwide manufacturer of specialized truck bodies produced to the specifications of its customers. Supreme also manufactures armored vehicles and trolleys. The Company's transportation equipment products are used by a wide variety of industrial, commercial and law enforcement customers. 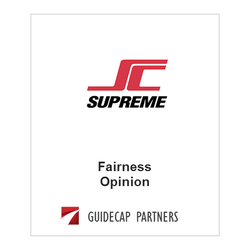 GuideCap Partners issued a Fairness Opinion to the Board of Directors of Supreme Industries, Inc.